You may have heard the phrase “dying is easy, but comedy is hard.” However, there’s only one way to make it even harder: incorporating comedy writing and business writing. Typical business writing is formal, straightforward…and, if we’re being honest, pretty boring. Comedy can be a great way to help your content stand out. But how can you engage your audience without going too far and driving them away? 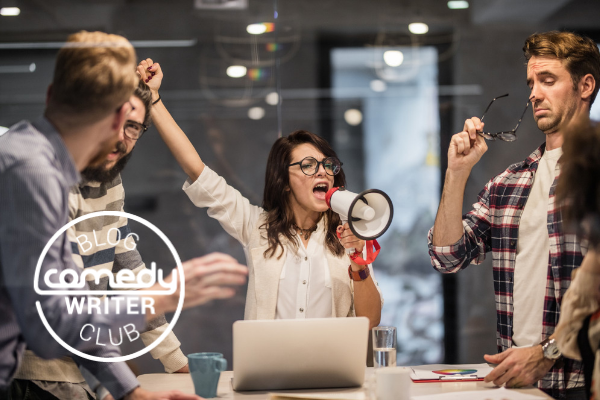 Don’t worry: we’ve put together a comprehensive guide to finding your comedic voice and incorporating it into your content. One rule about comedic business writing is nice and simple: it should be a mixture of comedy and business. Sounds simple, right? What we mean is that your content should never be all comedy or all business. If the content is all business, for instance, you lose the comedic edge you were going for. And if the content is all comedy, then you will fail to promote your products and services to your customers. Think of comedy as a really good steak sauce. It’s there to enhance the meat, but it can’t provide enough sustenance on its own. Quick: name your favorite comedic novel! That’s definitely the case with comedy in business writing as well. At the end of the day, comedy can never serve as a crutch to prop up bad content. Instead, comedy should serve as an engaging and natural way of selling something to your audience that is of genuine quality and merit. Here’s a lesson even famous comedians have struggled with lately: it’s never cool to punch down. Your business writing gives you a platform, and the platform gives you authority. You should never be using this as an opportunity to mock or devalue any members of your audience. In fact, the “safest” comedy for business writing focuses on more abstract entities. You might poke fun at the industry’s love of buzzwords, for instance, or even engage in meta-comedy about how everyone falls for online clickbait. These give you an opportunity to playfully poke fun at yourself and your industry without driving your audience away. And as a bonus, this kind of comedy helps establish that you are an insider that understands the concerns and experiences of your audience. Some of the absolute best places to incorporate humor is into your titles and headers. Why is this? For most business writing, titles and headers tend to be dreadfully dull. Part of the reason for buzzword fatigue is that audiences keep seeing the same words in prominent places. You can only read things like “SEO” and “thought leader” in so many titles and headers before they stop having much meaning. Instead, consider playful titles. “A title like DrinkedIn: How the Oldest Form of Networking is Making a Comeback” helps to poke fun at our LinkedIn fascination while also intriguing potential readers as to what you have to say. Chances are that your website has an “About Us” style section. And you’ve probably read dozens (perhaps hundreds) of these sections in which an author bloviates over dubious accomplishments. That’s why this is such a great section to incorporate humor. Specifically, this is a great section to incorporate healthy doses of self-deprecating humor. You don’t need to include a lot (again, comedy is your style, not your substance). However, even a little bit of comedy helps to show your audience that you’re not afraid to laugh at yourself from time to time. And that kind of refreshing honesty may just be enough to lure the audience over to your side. Another great place to include comedy is in your closing comments. And this actually goes back to something you may have learned back in high school English class. Teachers always stressed that a conclusion should restate your main points and end on a memorable note. How do you end on such a note, though? That’s where most writers end up stumbling. However, comedy can add some extra energy as you are going back over your main points. And it helps to engage your audience: they go from thinking you’ll just say the same old thing to wondering what you will say next. Finally, comedy in a conclusion helps to drive home a sense of intimacy and connection with your audience. This is crucial because the conclusion is usually where you’d place your call to action. In short? Get their laughter and then get their business!